If you haven’t had your teeth professionally cleaned or examined in a while (or ever), it’s normal to have a few questions when it comes to preventive care. Even though dental check-ups are very routine, it helps to know exactly what to expect during your visit. 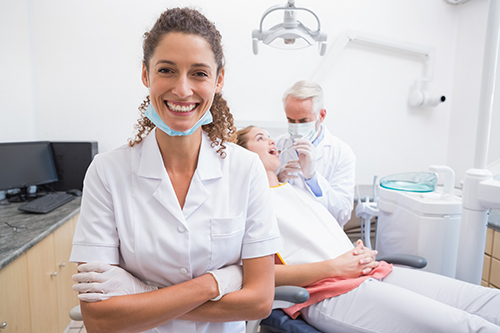 In this post, we’ll break down a typical visit to the dentist so that your first visit to Briter Dental can be as smooth and anxiety-free as possible. Your visit to the dentist may start before you ever arrive. For your convenience, our website contains patient forms you can download and complete before your arrival, or you may complete them in the waiting room at our office. These forms give us a full history of your dental and medical health, including important information about the types of medications you may be taking and any health conditions or symptoms you may have. Be sure to include any allergies you may have, and bring your insurance card to your first visit. Inside the exam room, you will be made comfortable in a relaxing chair. A dental hygienist will look in your mouth using a small round mirror that gives visibility to the backs and sides of your teeth. This visual exam can reveal any obvious decay, gum inflammation, or other issues and ensure it is safe to proceed with a dental cleaning. Depending on your age, oral health concerns, and how long it has been since your last visit, we may recommend an x-ray of your teeth. This can give us insight into the source of certain types of symptoms, such as temporomandibular joint complications that are causing headaches and jaw clicking, or hidden cysts, abscesses, or decay that are causing chronic pain. We can also use x-rays to examine your natural bite and where your top and lower arches meet. Tooth cleanings are a routine part of preventive care and highly recommended for most patients twice per year. They compliment your at-home oral health routine by gently scraping away built-up plaque and tarter that is not removable with brushing alone. Your hygienist will use a mirror and scaler to remove dangerous plaque between your teeth and surrounding your upper and lower gum line. It’s normal to hear the sound of scraping during this process, but it is a generally comfortable experience. Next, your hygienist will buff and polish your teeth with an electric tooth brush and an abrasive toothpaste. This helps wear away any lingering plaque and polish the teeth to a smooth, clean shine. This is typically followed by professional flossing to remove any lingering plaque and debris between the teeth. Finally, your mouth will be rinsed, and you may receive a fluoride treatment to help strengthen the teeth and make them more resistant to decay. Before you leave, you will schedule your next visit. If there are any issues that need treatment, such as cavities, you may need to return for a dental filling. If not, you will schedule your next dental exam according to the recommendations of the dentist – usually about six months in the future. If you are looking for a new dentist in Katy or have questions about what to expect at one of our office check-ups, give us a callat (281) 492-8900 to speak with one of our helpful team members. We look forward to serving you soon.